Boikido’s brightly colored wooden toys are always a favorite of ours. From their latest line of introductions, this smiling snail puzzle offers different types of play for different ages. 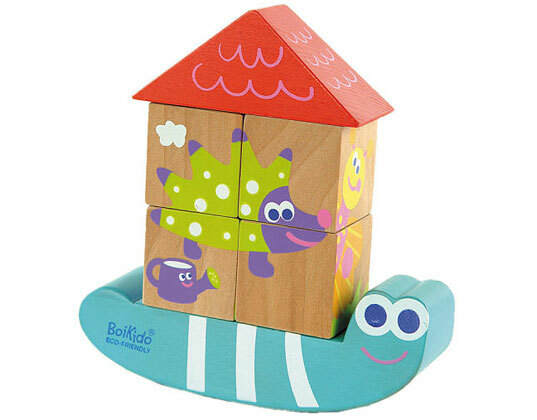 First, it provides stacking fun for 18-month-olds and later, older toddlers can match the cubes to create different scenes on the snail’s back. The puzzle is made from FSC-certified wood and finished with water-based paint. Even the packaging is green — a recycled box printed with soy-based inks. Boikido's brightly colored wooden toys are always a favorite of ours. From their latest line of introductions, this smiling snail puzzle offers different types of play for different ages. First, it provides stacking fun for 18-month-olds and later, older toddlers can match the cubes to create different scenes on the snail's back. The puzzle is made from FSC-certified wood and finished with water-based paint. Even the packaging is green -- a recycled box printed with soy-based inks.